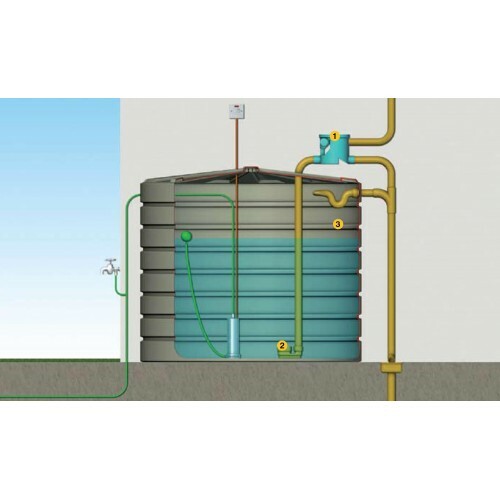 Capture and store rainwater run-off from your roof using a Rainwater Harvesting System. Simple and affordable rainwater systems. Tanks from 150 litres to 30,000 litres, tanks can be joined in series, with balance kits, if required. Rainwater is an asset that doesn't just save money but also reaps dividends for farming and the environment. Freshwater is an increasingly scarce, precious and expensive resource. How does rainwater harvesting work? A storage tank is fitted to your stormwater drain from your roof and falling rain enters the tank through a filter which removes leaves and other debris. How clean is the water? In order to remove particles and other matter Rainwater is filtered when entering your storage tank. It is kept in the dark and oxygenated to discourage algal growth. Inbuilt calming inlets ensure that any sediment at the bottom of the tank does not get stirred up. Note. this water is not fit for human consumption. Where do you want to put your tank? Identify your preferred tank location and measure the space and height available, then choose your vertical or horizontal rainwater harvesting tank. Choose from the 3 filter kits. Kit A - will service a 200m2 roof area and is better suited to general use and yard wash down. Commonly used on tanks up to 10,000 litres. Kit B - will service a 450m2 roof area and is better suited to Wc flush and applications where a better quality of water filtration is required, dairy, vehicle wash down and much more. Commonly used on tanks between 5000 and 30,000 litres. Kit C - will service an 800m2 roof area and has exactly the same filtration mechanism as kit B. © Copyright 2019 - CHF Supplies - All rights reserved.